Students who frequent UCSC’s Quarry Plaza understand that the first week of the quarter is a game of Minesweeper for those actively trying to avoid contact with UCSC’s Greek letter organizations (GLOs). As a member of a women’s fraternity — a proud sister of Kappa Kappa Gamma — I’ve certainly had my hang-ups about joining a system with such a mysterious and elusive past. If you ask any student at UCSC about GLOs, most of them will murmur something vague about a “koi pond incident” — but nobody seems to know the facts. However, I’ve discovered over the course of my four years as a banana slug that everything is just a little different at UC Santa Cruz. For instance, we do boast an extensive Grateful Dead archive, an extremely unconventional mascot and the woodsy beauty of a high-end summer camp. Just like the campus in general, the fraternities and sororities at UCSC deviate from the norm — GLOs at UCSC, in my experience, are far different from what might be represented on television. For my first few quarters at UCSC, I too avoided the girls with the colorful and girly booths, like many other students. With membership spread across 27 nationally-based and local organizations with Greek letters in their crest, GLOs have expanded to include a variety of options, including national fraternities Sigma Pi and recently chartered fraternity Tau Kappa Epsilon, as well as two national sororities, Kappa Kappa Gamma and Gamma Phi Beta. GLOs are substantially bigger at universities like UCLA and UC Berkeley — both of which could brag that at least 10 percent of their respective campuses are Greek — but it is fair to say that UCSC’s relatively hidden societies are certainly growing in number every year. Janet Young, a cataloguer for the Special Collections and Archives at McHenry Library, said GLOs in Santa Cruz had a tumultuous beginning. Young has been at UCSC since the spring 1977, back when the school only had about 6,000 undergraduate students. At the time, 65 percent of students and 63 percent of faculty were against the addition of GLOs to the campus, according to a City on a Hill Press article from 1987. Young said GLOs were met with staunch adversaries, including community members, campus leaders and student-run organizations, such as Students Against Greek Establishment. “It was a big deal. If you went over to where the bookstore is, there would be people tabling against the Greeks and for the Greeks,” Young said. The source of the bad reputation that UCSC’s GLOs have obtained can be traced back to the media — most prominently, a now infamous incident involving an MTV television show called “Fraternity Life” and a now-defunct fraternity called Delta Omega Chi (DOC). Much to the disdain of the university, some members of DOC captured, cooked and ate a koi fish from the Porter Koi Pond for the cameras of the show — which was canceled in 2005. Delta Omega Chi lost its accreditation with the Student Organization Advising and Resources (SOAR) and has yet to recover this affiliation. Today, the reputation of GLOs at UCSC remains tarnished due to this embarrassing occurrence. However, most members of a GLO will tell you that just like any family, you take the good with the bad. 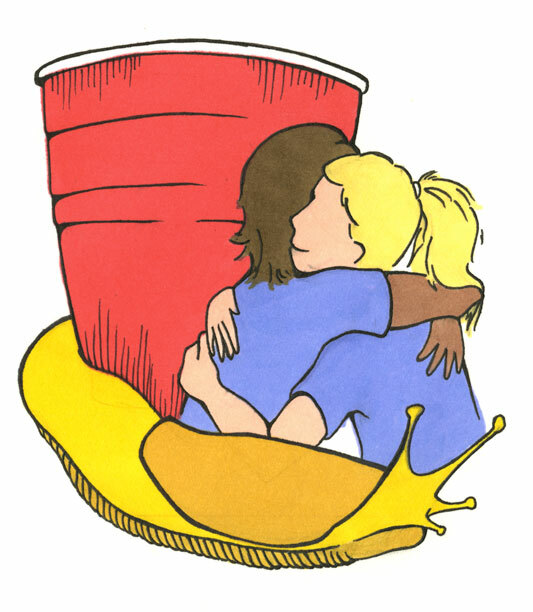 While it is a dominant thought that some people in GLOs are simply in their organizations to drink and party, many of them use their brotherhoods and sisterhoods as an outlet to serve others. I love my sisterhood, and I love being involved with GLOs, but there are problems and difficulties that come with joining any institution, sororities and fraternities included. One of those difficulties is the reception of GLOs by the rest of the student body, which is historically not great. No institution is perfect. I can see how someone who watches prime time television or movies involving GLOs might assume fraternities and sororities are the same everywhere — shows like “Greek” and “Sorority Wars” among others tend to portray fraternity members as loud and perverted jerks and sorority members as stupid and spoiled, which is lightyears away from my experience. I’ve met some of the most intelligent and driven young people and made lifelong friends in a multitude of different organizations. However, the stigma tends to remain the same. I don’t see the world through rose-colored glasses, no sir. I recognize that while no institution is perfect, if you look past the rumors and judgments, there are some totally valid reasons to dislike GLOs. Let’s start with the obvious one — that we pay for our friends. There is validity to this argument, as GLOs at UCSC (and nationwide) can cost a pretty penny, especially if your campus has university sanctioned Greek housing. Although there are no official fraternity or sorority houses in Santa Cruz, potential new members can expect to pay a relatively high price for brotherhood and/or sisterhood. However, some fraternities and sororities on campus may offer payment plans, reduced membership or other programs to allow brothers and sisters to participate in events without breaking the bank. Yes, being a member of a GLO is costly. But I’m not paying my sisters to study or spend time with me — they do that because they want to. In nearly all cases, the money for dues goes to sorority sanctioned parties, programming and service events. That being said, my good friend Precious Wingo, a fourth-year literature major, brought up another criticism of GLOs. I respect this opinion and agree — we can always be doing more for the community. From my experience, many UCSC GLOs made philanthropy a priority over the past few years to help repair the reputation of fraternities and sororities on campus. In fact, part of the reason why I fell in love with my sorority was because of our national fundraiser, Reading is Fundamental, which focuses on ending childhood illiteracy. This is a cause that has always been important to me as a former elementary school educator and as a voracious reader. While it is a dominant thought that some people in GLOs are simply in their organizations to drink and party, many of them use their brotherhoods and sisterhoods as an outlet to serve others. That’s why I joined. Well, one of the reasons. While I was something of a rock star at avoiding sorority girls at Quarry Plaza, my own curiosity overtook my pretentious dignity. I became fixated on one sorority, which will remain nameless. At the time, I was a first-year from a small Catholic school in Oakland. I never had siblings or friends, so after a brief aversion to sororities, I began to embrace the pledging process of a small, local sorority. I felt a little out of place, but I ignored this feeling throughout the quarter. During those 10 weeks in which I pledged for this sorority, I couldn’t help but notice how different each of the sororities at UCSC are. 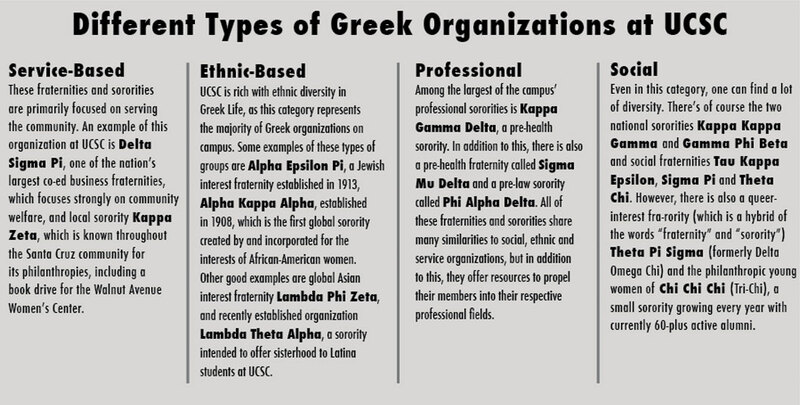 I wanted nothing more than to be an official member of my sorority at the time, but I certainly was curious about the other sororities as well — the ethnic based, the philanthropic, the co-ed and the two Panhellenic (an umbrella term meaning “national”) organizations. However, I stayed loyal and attentive to my sorority throughout the process. This sorority kicked me out at the very end of the 10-week pledging process, three hours before the crossing ceremony. I carried that chip on my shoulder for the rest of my freshman year, becoming an identifiably “anti-sorority” girl. I thought that was cool. It wasn’t. Fall quarter of my sophomore year I continued my sport of dodging tables at Quarry Plaza for fear of getting my feelings hurt again. One girl cornered me, and held out a colorful pamphlet with the expectation that I would reach out and grab it. I scoffed at the pamphlet at the time — the same pamphlet hanging over my desk today. She looked at me like I was crazy. “No! Of course not!” Without warning, she stuffed the crumpled pamphlet into my clenched fist. That girl, Danielle, is now my sister —two weeks ago she pinky-promised me she would design and bake my wedding cake. Most members of GLOs will tell you they were completely different before they joined their organization. I haven’t changed one bit since seventh grade. My favorite show is still South Park and I still think Jesse McCartney is the sexiest man alive. In fact, I pride myself on my stubborn determination to remain the same as I always was. To this day, if you ask me, I’ll tell you that being a part of a GLO hasn’t changed me, but I noticed some fundamental differences between who I was before I was Greek and who I am today. Three years ago, I thought of myself as undeserving. I thought of myself as uncool because of my dorky, annoying quirks, because I had spent my whole life trying to find people who will accept those quirks. That’s why I didn’t fit in with the first sorority, because while they accepted those quirks to an extent, I deserved people who loved them and embraced me. As I didn’t have to stifle my weirdness, or my quirks, or anything that made me who I am, I noticed I was leaving my shell and becoming more of the woman I wanted to be. I wasn’t becoming Elle Woods, or Charlotte York, or any of those stereotypical sorority girls you see on TV. Three years later, I became a woman who embraced all parts of herself, and I’m no longer apologetic for who I am. I learned that from my sorority. I never changed. I became more of myself.